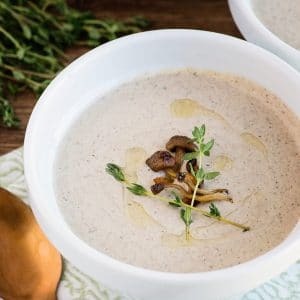 This homemade mushroom soup is absolutely amazing, better than any canned soup with fresh thyme and shallots – it’s easy to make and the flavor is amazing. I’ve never really cared for canned soups, I use them in casserole recipes I grew up with, but never EVER just open a can and heat up soup. I’m also not a huge fan of mushrooms, it’s a texture thing, but I love the flavor of mushrooms, so 6 years ago, when this blog was brand new, I decided to experiment. Seeing if I could make a substitute for Cream of mushroom soup I could use in recipes. 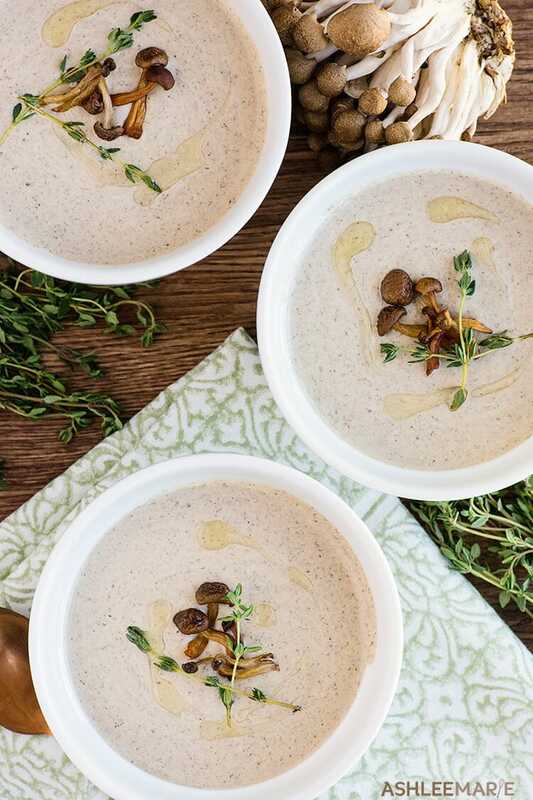 I love love LOVE this soup, but it isn’t a substitute for cream of mushroom. It’s not quite thick enough, and it’s a bit too delicate for casseroles. BUT by itself it tastes AMAZING. 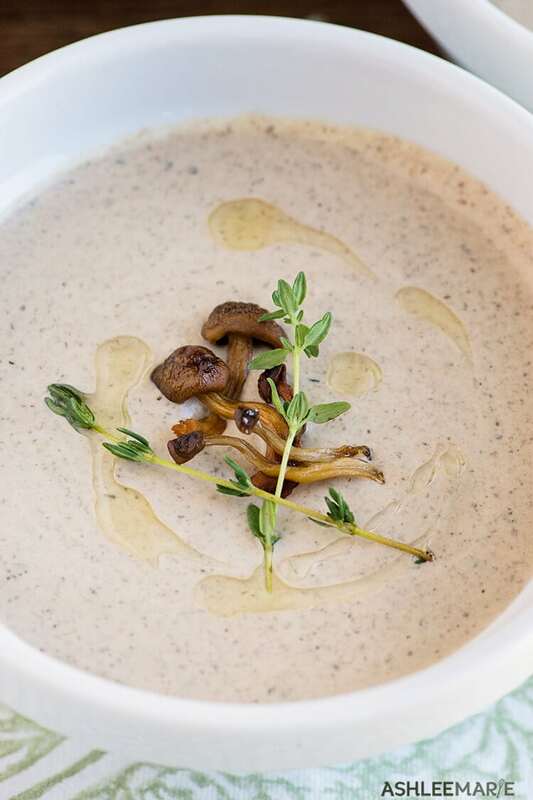 In fact a few years ago I tried out a new local restaurant, La Jolla Groves, and DIED over this mushroom soup they have as a starter. Then I remembered this recipe! I hadn’t made it in years, so I pulled it out again and was thrilled. It was just as good as I remembered. In a food processor coarsely chop mushrooms and lemon juice. Melt butter in sauce pan and lightly saute shallots on med heat. Add mushrooms, thyme and bay leaf. Saute over low/med heat for 10-15 mins, until the liquid that is released from the mushrooms disappears. Add salt, pepper, cream and chicken stock, bring to a boil. Reduce heat and simmer for 20 mins. At this stage I like to take a few cups of the soup at a time and run it through my blender to smooth it out a bit, but it's optional. Stirring constantly, add more seasonings and lemon juice to taste. 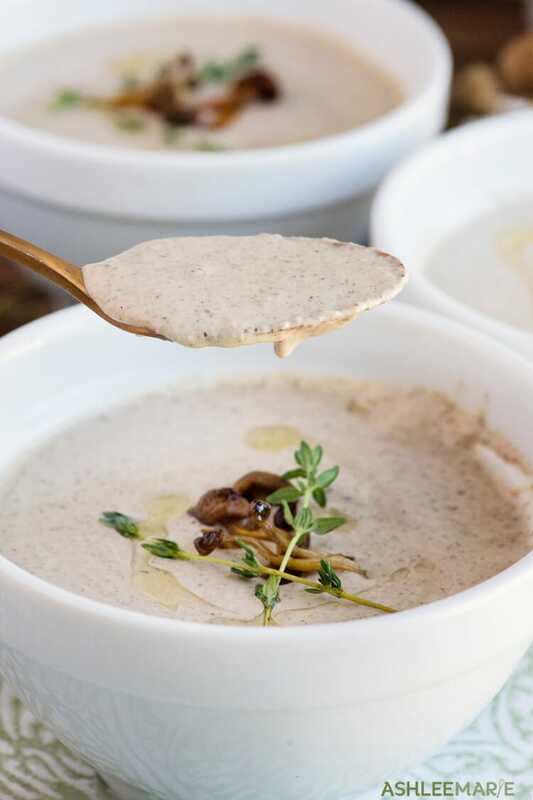 This is the BEST cream of mushroom soup I’ve ever had. I did thicken it with a bit more flour than the recipe called for as I like a thicker cream of mushroom soup, but other than that, I wouldn’t change a thing. Definitely making this again and again. Thanks! I agree, I love this soup! I’m so glad you tried it and liked it! I like it a tad bit thicker too!